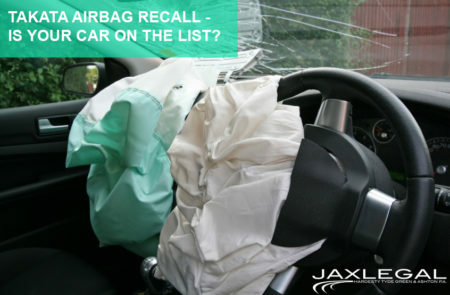 One of the biggest stories of 2014 involved the recall of more than two million vehicles that had potentially dangerous airbags. The National Highway Traffic Safety Administration issued a dire warning last fall to vehicle owners across the country because of the potential for the canister holding the airbags to explode; which could send pieces of metal into unsuspecting drivers. The pieces were found to be responsible for the death of a Florida woman who was involved in a car accident and her airbag inflated. The airbag was supposed to save her life, but it ended up killing her. Fast forward to 2015, and it appears that the airbag problems for Takata and automakers that use them have not been abated. According to a number of media reports, the airbags are being recalled because they could inflate unexpectedly (without a collision) while the car was running. The NHTSA indicated that the latest recall, (like the previous one) was an urgent safety issue. The current recall covers the Acura MDX, Honda Odyssey, Toyota Corolla and Matrix, the Jeep Grand Cherokee and other vehicles. As we have highlighted before, it is important for automakers to initiate and cooperate with recalls. They have a continuing duty to consumers to keep them safe from dangerous defects.